The London-based article-level metrics provider Altmetric published a list of their top 100 highest-scoring articles yesterday (access the full Top 100 list). For essential context, please read the accompanying blog post by Cat Chimes here, as well as her “Unwanted attention?” November 14 2014 post here. This recent post on how Altmetric tracks global news will also be relevant to understand the context of the list. I am interested in how bibliographic datasets can be subject to ‘distant reading’: can we learn something from looking at what words are used in the titles of articles being mentioned online by larger audiences? Are there any correlations between wording in title, topic, methodology, discipline, or region and an output’s access type? The Altmetric 2014 Top 100 journal article titles as a Cirrus word cloud using Voyant Tools and applying TaporWare English stop words. 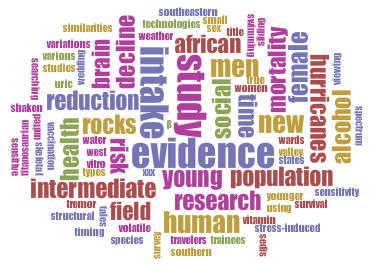 The Altmetric 2014 Top Open Access journal article titles in their Top 100 list as a Cirrus word cloud using Voyant Tools and applying TaporWare English stop words. I have deposited on figshare a spreadsheet with the list of the 37 open access articles, including journal/repository names, URLs, published dates and region of authors affiliations. 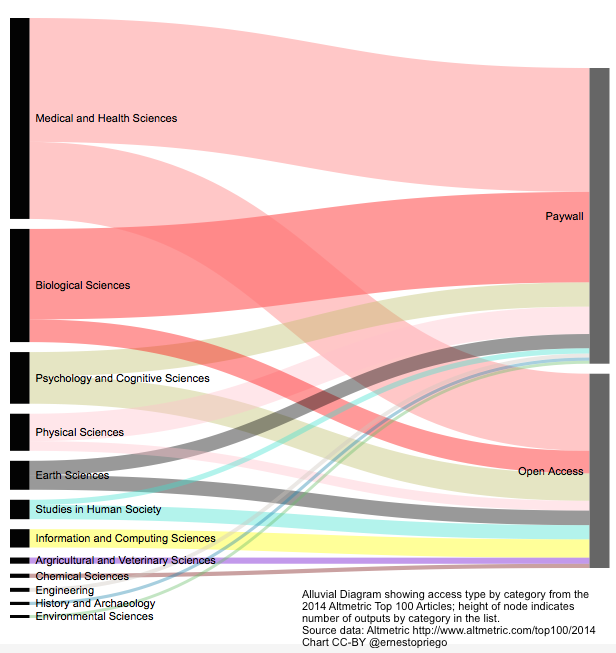 For what it’s worth these were the open access outputs that were most-mentioned online according to Altmetric in 2014. Let’s see what happens next year. As part of my ongoing research I also made this alluvial diagram visualising access type by number of outputs per category, which exemplifies quite directly in my opinion, at least from this specific distance, the dominance of certain disciplines in terms of article-level metrics, but also certain’s disciplines preference within this particular corpus for particular access models.